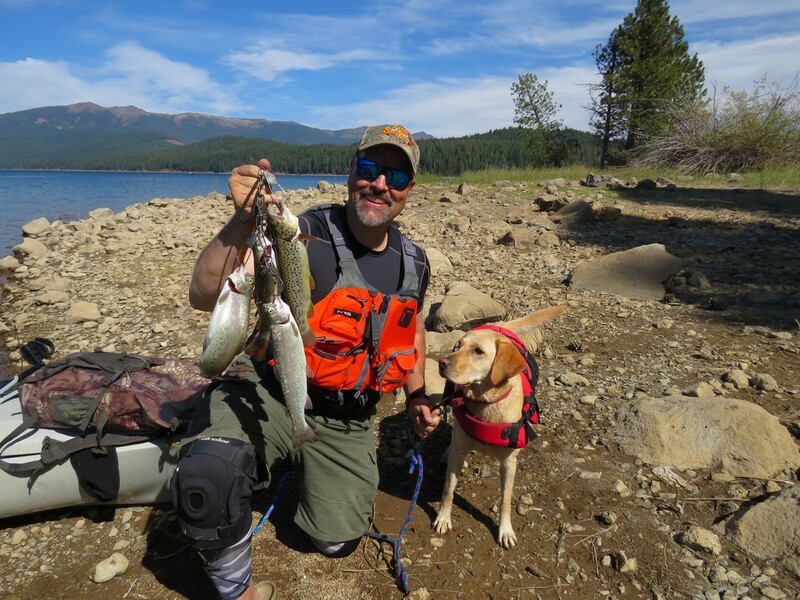 Almanor Adventure Produces Browns & Rainbows! My wife Gena loves to fish. With me fishing from a kayak she missed out on a lot of action in the first half of this year, but that changed in late August when I picked up a 12’ Hobie Compass Mirage Drive peddle kayak at Kayak City in Citrus Heights, making us a two kayak household. Gena would now have an awesome platform to fish from! Our first duo trip to French Meadows was good in that Gena got out in the kayak and learned the ropes of operating the Compass, but it was super windy so she didn’t get in much fishing. Last week we headed up to Lake Almanor for our second duo trip, and it all came together big time! Our plan was to launch at Canyon Dam fairly early and then spend the rest of the day fishing near the dam. Our kayaks are capable of carrying lots of gear, so in addition to Lucy the Labrador we also had an ice chest with lunch, drinks and snacks. In short, we had everything we needed for a shore lunch and multiple breaks throughout the day. Of course, I wanted Gena to catch some fish and I was a little worried. Almanor is home to some impressive trout, but they can be tough to catch and the moon was inching up on full. Typically, trout fishing gets tougher during a full moon period. Little did I know that my worries were unfounded. As I launched one of the Canyon Dam maintenance staffers started chatting with me about the kayaks and shared that both 1 pound browns and eagle lake rainbows had been recently planted and that the fishing was hot. 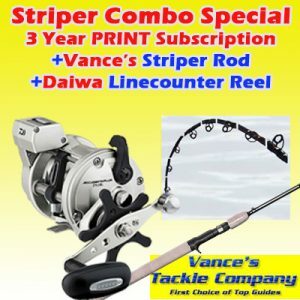 Gena’s spinning rod was armed with a ¼ ounce chrome and blue Kastmaster. I had a naked threaded crawler set up on my hybrid leadcore rig. As we paddled out I could see small clouds of pond smelt and lots of larger marks on my sonar screen. Stopping in the mouth of the cove nearest the dam, Gena started fan casting and I started a slow troll in a big circle around her. Before I could get the worm in the water, she was yelling, “Fish On”! ”Fish On”! Another dandy rainbow. I was trolling right through them and I couldn’t get a touch. The worm had to go. I stopped peddling and drifted a bit as I took off the worm and leader. “Fish On!,” Gena yelled from 100 yards away. She was smoking me. Gena had three trout and I hadn’t even gotten a bite yet. “So they want something that looks like a pond smelt?,” I thought. I wasted no time grabbing an old favorite, the tried and true Captain America Hum Dinger! Wham, I was hooked up! It turned out to be a fat brown. I released the fish at the side of my Pro Angler 14 and got the gear back into the water. Gena was now trolling her way down the lake toward Rocky Point so I followed. She got the occasional hit and so did I, putting a trout on the stringer now and then. I wanted some fish for a meal or two, but I didn’t want to limit out. For the rest of the day we paddled, picnicked, played with Lucy and caught trout. I’m not sure how many we caught. 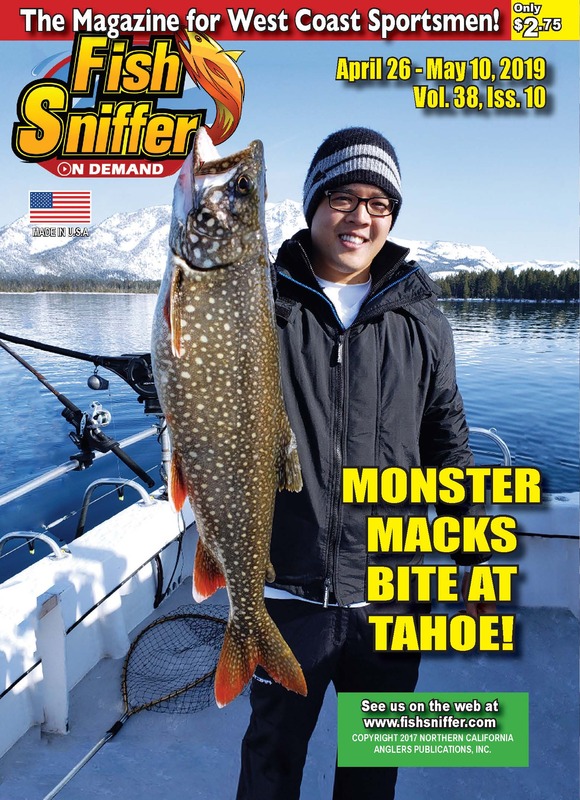 They weren’t the big wild brutes that Bryan Roccucci pulls out of Almanor, but they were high quality planters that put up a great fight and were already getting tuned into the lake’s amazing forage base. Hmmm, she must not have noticed that 14 inch orange blue paracord tether I’d attached to it! I didn’t say a word, but the way she said it struck me as hilarious. It was all I could do not to laugh out loud! Want to get into kayak fishing? Kayak City is YOUR official Hobie Kayak dealer in the Sacramento area and their staff will answer all your questions. The main store is located at 7812 Auburn Blvd in Citrus Heights, Ca. 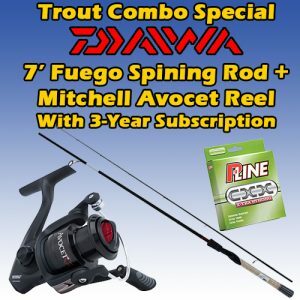 (916) 565-1400 or visit them online at kayakcity.com.